The painters have started applying the aqua-gray paint and I love it. Steve actually made the final color decision, so I give him props. 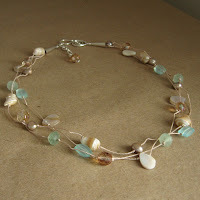 The color combination actaully reminds me of a necklace I made recently, a bead mix I call beachy neutrals: aqua for the water, pale browns for the sand. The tile is grouted and the trim is installed, but there was a delay on the shower door so it will be another coupla weeks until we can actually use the shower. 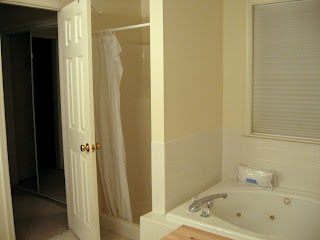 The contractor offered to put up a temporary curtain, but I opted to take baths or keep using the hall shower. 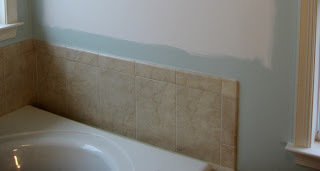 I feel like we’re in the homestretch of this bathroom project. 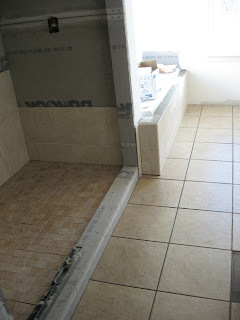 The tile is going down today and tomorrow, then baseboard and painting and they’re done. I think. I haven’t had to set my alarm clock for weeks; the doorbell rings first thing every morning. The construction paper protecting our floors is wearing thin. I feel like I’m trapped in my own home, unable to run errands until the guys leave. But, so far we’re on schedule and it looks great. We went with a cocoa colored tile on the floor in two different sizes (2x2s in the shower = more grout = more traction), and a sand colored tile on the wall. Yes, they look identical in the picture. I’m still trying to decide what color to paint the walls. Steve said he doesn’t care as long as it’s not brown, which of course made me want to use brown. I think I’ve narrowed it down to gray-aqua or celadon, nothing too dramatic. 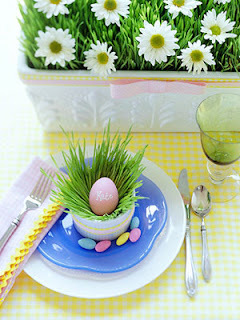 I found a picture in Better Homes & Gardens that shows a garland of hollow dyed eggs for Easter. I don’t normally get into holiday decorating, but we eat a lot of scrambled eggs and I think an egg garland would be a nice addition to my Easter tree. Like a necklace, only bigger. I blew out 6 eggs before I passed out, so maybe little nests like these with individual eggs would be better, say half a dozen of them scattered around the house. Or I may invest in an egg blower. There’s a bush in our flower bed that needs to be heavily pruned or chopped down, and while Steve and I were surveying it I noticed a bird nest in the branches. So of course I brought it inside because it’s not every day you can find a real nest without disturbing eggs. Then a couple weeks later I was out with my friend Molly and saw an empty nest in a parking lot tree. I came very close to taking it, but she suggested the bird may want to re-use the nest so I left it there. Begrudgingly. 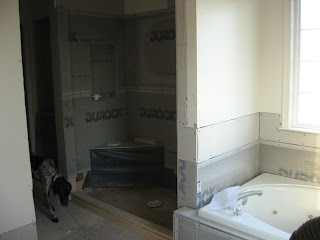 The rare silence in our house is a reminder to give you guys an update on the master bathroom project. The shower has been roughed in, cement board installed, and rubber liner put in place (or at least started. The shower is now so big that I had them install a seat to take up one corner. The drywall has been replaced where the tile was ripped off the walls, and the mud & tape part of that is supposed to happen tomorrow. The electrician put in a couple new lights and rearranged the existing switches to make more sense. Riley has been very good about staying out of the workers’ way, but she did come in to inspect while I was taking pictures. Always keep several get-well cards on the mantel, so if unexpected guests arrive they’ll think you’ve been sick and unable to clean. This weekend (Fri-Sun) is my PMC Certification course. It’s going well so far, but I’m wiped out! We are finally doing the bathroom renovation! I had a contractor come out to give me an estimate in the fall and I never heard from him again. Then Christmas happened and we finally found a good contractor. “But I thought you already worked on that bathroom.” Yep, we made some great changes in the vanity area which will remain intact, but our shower is still smaller than a coat closet and the general feel of the room is rather sterile with the gray and white tile. 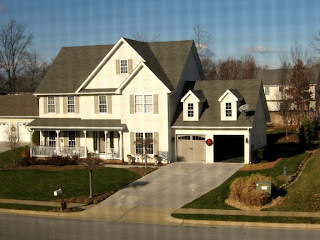 Pictured here is a “before” shot. (Totally unfair being at night and all, kind of like the pre-plastic surgery photos where the woman doesn’t smile).Our plan is for the team to remove the fiberglass shower, annex part of the adjacent closet (not our main closet anyway), and retile the whole room in sand and cocoa tones to warm up the space visually. 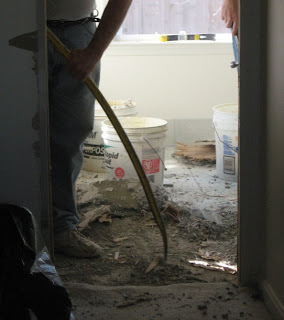 Right now they’re smashing tile, so it’s a good thing Steve’s not working from home today. I want so badly to go in there and help; I have an unusual hatred for that tile.Riley has been great at welcoming all the strangers into our home (some watchdog), but other than our walk with my mom this morning we are shut in my studio so Riley doesn’t get in the way. We had a wintry mix last Friday, which I think is so beautiful. Here are some pictures of our holly and other yard things, encased in glass (or so they look). I’m still here, getting jewelry and kits in the mail as soon as I can, ordering supplies, shoveling snow, Christmas cyber-shopping, sipping tea. The instant hot water feature in our kitchen is something I noticed the first time through the house and I LOVE IT! Want a cup of tea? Find a bag and fill your mug. No microwaving, no tea kettle. Another thing I love about this house is that we have a gas fireplace that turns on with the flip of a switch. 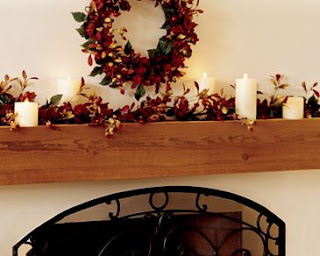 I like to make little vignettes with decorative objects here and there, and now because we have a fireplace we also have a mantel. I’ve been tearing out mantelscape ideas from magazines (like the one pictured) for years. My name is Anne and I’m a decorating dork. I think the moment my neighbors swallowed their last bites of turkey & stuffing they got the ladders out to trim their houses with lights. I have no problem with this whatsoever, in fact I am so touched AGAIN to be in this wonderful neighborhood. I have a front porch for the first time in my adult life, so I’m hoping to put garlands on the railings. Steve and I found an old Flexible Flyer at the flea market a few weeks ago to prop by the front door, and we’ll put a light in each window. That’s about all we do for the outside; Griswolds we are not.